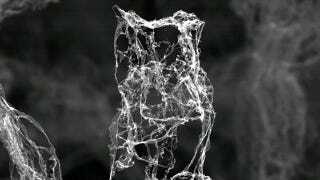 It looks like a wisp of smoke or even the work of a very confused spider, but this is actually a close up of the lightest material that has ever been created. Previous record holders include aerogel, which was used by NASA to collect dust from a comet and is 99.9 per cent air with a density of just 1 milligram per centimetre cubed. That was recently beaten by the metallic microlattice, which upped the stakes to 0.9 mg/cm³. Now there is aerographite, which easily smashes the previous record. With a density of less than 0.2 mg/cm³, it is barely there at all. Researchers at the Hamburg University of Technology and the University of Kiel, both in Germany, made it from a network of hollow carbon tubes grown at nano and micro scales. As the electron microscope picture above shows, it is mostly empty space, though if you held a clump in your hand, it would look like a black sponge. Its sparse nature means aerographite can be compressed by a factor of a thousand, only to spring back to its original size. The material can also support 35 times more weight than the same mass of aerogel. Aerographite's ability to conduct electricity means it might also find a use as part of an ultra-lightweight battery.